Over a quarter of the population in England has a long term condition (LTC) and an increasing proportion of people have multiple conditions. The Five Year Forward View (5YFV) notes that ’long term conditions are now a central task of the NHS; caring for these needs requires a partnership with patients over the longer term rather than providing single, unconnected “episodes” of care’ (1). The two key factors for developing a LTC are lifestyle and ageing. Prevention, delaying onset and slowing progression of long term conditions can happen through improved public health, messaging/targeting personalised care planning, health checks, information and supported self-care. It is important that the wider population is supported to take more responsibility for its own health. Although Surrey has a healthy population the proportion of people with one LTC in Surrey is approximately 30%, and the proportion with 2 LTCs is approximately 12% (2) . The most prevalent condition being hypertension. Variations in disease prevalence translates into higher rates of hospital admissions for people living in more deprived areas. For instance the rates of emergency hospital admissions for CHD are almost 3 times higher in Maybury and Sheerwater and Stoke as they are in Haslemere and Hambledon. With an ageing population projected needs for health and social care provisions are expected to rise which, in a climate of financial austerity, create significant challenges for commissioners as they ensure that the prevention and management of care for people with LTC will be sufficient to meet the growing demand. Certain conditions such as sensory impairment for instance increase drastically with age. It has become particularly evident that NHS and social care services as currently configured for LTC care are not sustainable going forward when factoring in the projected increase in comorbidities and the associated level of need predicted. While achieving positive outcomes in relation to modifiable health behaviors may take years before they come to fruition there are nonetheless opportunities for commissioners in health and social care to make an impact right now. In particular analysis of RightCare data has identified areas where attention should be given priority. For example In North West Surrey CCG non-elective spend on heart disease is shown as being worse than other similar CCGs thus opening up potential opportunities for potential non-elective savings of £1.7m. Opportunities also exist as part of the transformation health and social care services are currently going through in relation to Sustainability Transformation Plans (STPs). The plans in Surrey and in Surrey Heartlands in particular have already identified the need for a single, evidence-based, best practice MSK pathway focusing on elements such as self-care and prevention in order to ensure that clinical interventions are delivered at the appropriate time. Finally, no significant achievement in terms of prevention, quality of care, financial management will be able to materialize without a much closer alignment of health, public health and social care services from the point of planning all the way up to the point of delivery. In particular an important aspect will be the link between care planning for individuals – empowering individuals to be involved in self-care for instance – and commissioning at population level which will require tighter relationships between local authority services across the two tiers (Surrey County Council and Boroughs and Districts), CCGs and providers. The Department of Health defines a LTC as a condition which cannot, at present be cured, but which can be controlled with the use of appropriate treatments and/or other therapies. Examples of LTCs include diabetes, heart disease and chronic obstructive pulmonary disease (3). LTCs and their effective management is widely recognised to be one of the greatest challenges facing the NHS and Social Care. LTCs can affect many parts of a person’s life, from their ability to work and have relationships to housing and education opportunities. 33% of GP appointments for patients with multiple long-term conditions. The DH estimates that the average annual health and social care cost per year for a person without a long-term condition is £1000. This rises to £3000 for a person with 1 long-term condition, and to just under £6000 for a person with 2, and approximately £7800 for a person with 3 (DH 2012). Approximately “70% of the total health and care spend in England (£7 out of every £10) is attributed to caring for people with long-term conditions” (DH 2012) (5) . By 2025 there will be 42% more people in England aged 65 or over. This will mean that the number of people with at least one LTC will rise by 3 million to 18 million and so will the costs associated with their treatment and care. Health and social care services and local authorities should be supporting people to be as independent and healthy as possible if they live with a long-term condition such as heart disease, asthma or diabetes, preventing complications and the need to go into hospital. If they do need to be treated in hospital, the NHS should work with social care and other services to ensure that people are supported to leave hospital and recover in the community. Adding to the challenge, increasing financial pressure will require commissioners to secure the best use of health and social care to maximise outcomes and improve patient experience, while ensuring efficient, affordable care into the future. With an ageing population and rising numbers of adults with LTCs, greater integrated working is necessary to achieve good outcomes for people and make the best use of scarce resources. A number of common risk factors are recognised as increasing the likelihood of LTCs which should be taken into account when assessing risk. These are age, gender and family history / genetic factors which are unmodifiable. For example LTCs are more prevalent in older people – 58% of people over 60 compared to 14% under 40- and in more deprived groups – people in the poorest social class have a 60% higher prevalence than those in the richest social class and 30% more severity of disease(6). Certain modifiable health behaviours including smoking, physical inactivity, poor diet, obesity and harmful use of alcohol increase an individual’s risk and can be changed to reduce risk. Bodily risk factors that reflect changes to body systems that are reversible or preventable if detected early include hypertension, raised cholesterol, diabetes and chronic kidney disease which may require medical treatment. There is evidence as shown in table 1 (6) which illustrates the contribution or joint contribution which certain risk factors have on the development of LTCs. Risk factors should be considered when planning and commissioning interventions aimed at addressing and managing LTCs, in particular the ageing population, which is likely to impact on the demand of services. Table 1: Individual and joint-contributions of top 20 risk factors in industrial countries. When considering the burden of LTCs on the individual and on healthcare services the chronic disease pyramid (7) (Figure 1.) shows a larger population could be targeted at the less complex end of the LTCs “pathway” including those who are pre-disease; for example those obese individuals at risk of developing Type 2 diabetes. It shows that investing in prevention including early identification is as important as managing the most complex cases. 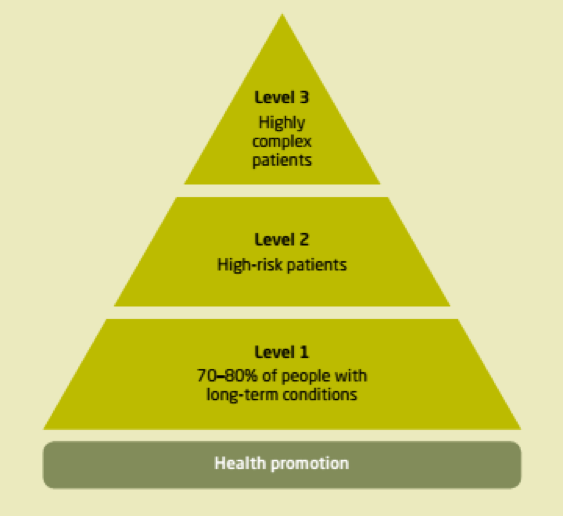 What the pyramid shows is that focusing on high-risk complex patients is necessary; frail older people in particular and those approaching the end of their lives have an important need for special support in their own right. But since these groups comprise a relatively small proportion of the local population, targeting a much wider group with preventive care and self-management support is a better way to achieve benefits that are measurable across a whole population. However LTCs should not been seen as just a health issue; they can have a significant impact on a person’s ability to work and live a full life. Rates of LTCs are unequally distributed across the population and people from lower socio-economic groups are more likely to suffer from LTCs compared to those from higher socio-economic groups (9). The rates of emergency admissions for stroke are almost 3 times higher in Maybury and Sheerwater and Stanwell North than they are in Farnham and Wrecclesham. Also, Horley West (29.3%), Stanwell North (29.1%) and Preston(28.9%) all have the highest estimated percentage of population with a BMI of 30+. By comparison Englefield Green West (14.7%) and Englefield Green East (14.7%) both have the lowest estimated percentages. CVD for instance remains one of the main contributors to health inequalities, with years of life lost increasing significantly with deprivation (1) and disease burden varying across factors such as age and ethnicity. As a result of health seeking behaviour and other complex factors, people from deprived areas are less likely to have CVD recorded by a GP, with practices in deprived areas also tending to show higher levels of exception reporting (2). Figure 3 demonstrates the contribution of circulatory disease to the life expectancy gap between the most deprived and least deprived quintiles in Surrey which is due to the poorer health outcomes experienced by the more deprived population groups. Figure 3: Contribution to the life expectancy gap between the most and least deprived quintile of Surrey, by broad cause of death, 2012-14. Surrey may be a prosperous county with a healthy population however NHS England data (this data can be broken down to CCG level) shows that 30% of those aged 18 and over live with 1 LTC, 12% with 2 conditions and 8% with 3 conditions. Although the number of people with only 1 LTC is projected to be relatively stable over the coming years it is expected that the number of people with multiple LTCs will rise significantly as people live longer. 14% of people in England aged under 40 have an LTC, this percentage rises to an estimated 58% for people aged 60+ (12) . In particular the rates of long-term conditions such as diagnosed coronary heart disease, diabetes, hypertension and musculoskeletal problems all increase substantially with age. Of particular importance is the relationship between people’s health behaviours and the development of chronic diseases. Looking at cardiovascular disease in general and hypertension in particular, evidence shows that 90% of the risk of having a heart attack (13) is directly attributable to modifiable risk factors such as excess weight, alcohol consumption, lack of physical activity and a poor diet. This is why the case for prevention is essential and should not be underestimated by commissioners. NHS England National Cardiovascular Intelligence Network (NCVIN) has created a national ranking (14) of CCGs based on health behaviours for risk of hypertension (these include obesity, lack of exercise and excess alcohol drinking). When modifiable risk factors are combined to give an overall hypertension lifestyle ranking, NHS Guildford and Waverley ranks 5th out of 209 CCGs for the combined lifestyle risk factors, NHS Surrey Downs ranks 9th, NHS North West Surrey ranks 23rd, NHS East Surrey ranks 24th and NHS Surrey Heath ranks 38th. 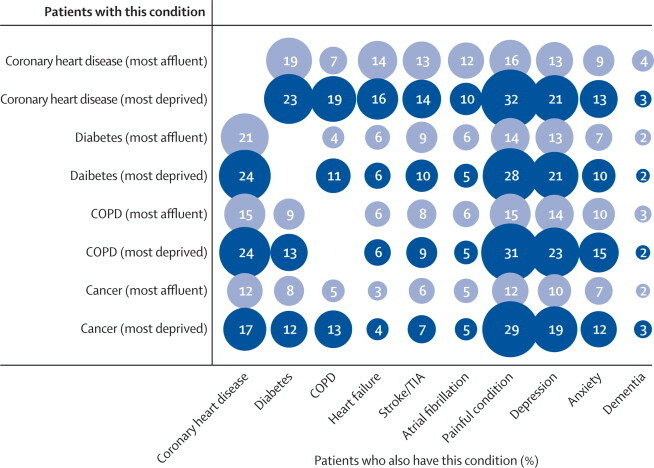 While these rankings show the least risk there appear to be substantial differences across Surrey CCGs which need to be taken into consideration when planning interventions aimed at identifying patients with the condition (15). In relation to musculoskeletal conditions the only available recorded prevalence rates are for osteoporosis (50+) and rheumatoid arthritis (14+). East Surrey CCG has the highest recorded rate of osteoporosis (out of all Surrey CCGs, while Surrey Downs CCG has the lowest. As for Rheumatoid Arthritis East Surrey CCG has the highest recorded rate while Guildford & Waverley and Surrey Heath CCGs have the lowest rates (see data visualisation). The prevalence of back pain and osteoarthritis (Knee & Hip) have been estimated, with estimates of overall prevalence and prevalence of severe problems. The estimated prevalence of back pain (general) in Surrey is 16.7% which is similar to the South East (17.0%) and England (16.9%) rates. Translated into number of people, this is an estimated 191,000 people with back pain in Surrey. The estimated prevalence of severe back pain — which for patients is likely to be limiting in terms of being able to carry out daily activities — for Surrey is 9.6%, similar to both the South East (10.1%) and England (10.2%) rates. This represents an estimated 109,867 people with severe back pain in Surrey. The impact of back-related functional limitations can be severely disruptive for people’s daily lives. A study on the subjective pain experience of subjects with back pain (16), found that a significant proportion of the people affected had reported various levels of difficulty to cope with sleep/rest, mobility, independence, leisure and the ability to work. The estimated prevalence of osteoarthritis of the hip (general) in Surrey is 10.3%, similar to the South East (10.7%) and England (10.9%), representing an estimated 52,065 people. In its more severe form the estimated prevalence rate is 2.8% which again is similar to the South East (3%) and the England (3.2%) rates. This represents an estimated 14,203 cases. The estimated prevalence of osteoarthritis of the knee (general) in Surrey is 16.7%. This may be lower than the South East (17.5%) and England (18.2%) rates and it represents an estimated 84,465 cases. In its more severe form the estimated prevalence rate is 5.1% which is lower than the South East (5.6%) and England (6.1%) rates. This represents an estimated 25,740 cases. In adults the main causes of blindness are age-related macular degeneration (by far the leading cause), glaucoma, cataracts and diabetic retinopathy. The number of people in the UK with sight loss is set to increase significantly in the future in particular among the 75+. In addition, there is a growing incidence in key underlying causes of sight loss, such as obesity and diabetes.The RNIB has estimated that almost two thirds of sight loss in older people is caused by refractive error and cataract. Both conditions can be diagnosed by a simple eye test. In most cases the person’s sight could be improved by prescribing correct glasses or cataract surgery. Over 50% of sight loss can be avoided (18) . Sight loss is often associated with social isolation, depression and other psychological problems; the links with other avoidable health problems include the correlation between eye disease and falls in older people (19). Equally there are acknowledged poorer health outcomes for the deaf community, despite similar patterns of risk factors to the general population (20). Some of the health difficulties faced by those with sensory impairments are the general access barriers in using healthcare services such as consulting with their GP (21); these may be particularly pertinent for those with (multiple) LTCs. There may also be particular difficulties in particular tasks necessary for managing conditions, for example taking medication as prescribed. A recent case-control study in 314 older people aged 65 years and over compared the adherence to medication between those with and without visual impairment, and found that the group with visual impairment had difficulty distinguishing different tables and needed help managing medication from friends, pharmacists or social service support (22). Data from PANSI regarding people with sensory loss show that the age group which is predicted to see the highest increase in serious visual impairment is the over 75s (Table 3). This group is also predicted to see an increase in the number of people with a registerable eye condition. This pattern is also expected to affect the number of people with a moderate or severe, or profound hearing impairment. The highest rises are predicted to affect those over 65, over 75 and over 85 (Table 4.). Overall the number of people with hearing impairment in Surrey (either moderate, severe or profound) is expected to grow from 120,844 to 170,962 by 2030. 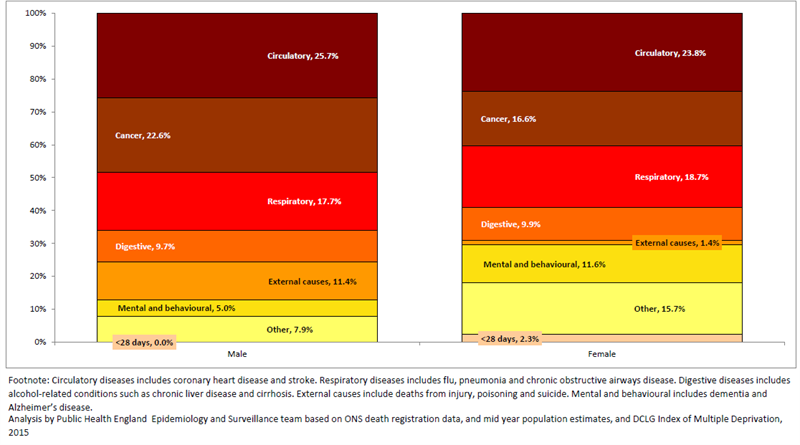 Finally, chronic diseases are also the most common cause of deaths and disability in England. As the number of people with a long-term condition or multiple long-term conditions is expected to rise over time the issue of empowering people to better manage their condition is crucial not only in terms of their health, but also their ability to lead a productive life. In this context the relationship between LTCs and work is particularly important because people with LTCs should be helped to remain in employment or return to work. The number of total claims due to Arthritis has gone down by 6.8% since May 2011, but up by 19.8% for the aged 65 and over. The number of total claims due to Heart Disease is gone down by 13.8% since May 2011, but up by 4% for those aged 65 and over. The number of total claims due to Diabetes Mellitus has gone down by 16% since May 2011, and down 3.7% for the under 16. While prevalence is a useful indicator to establish the proportion of a population with a specific characteristic, evidence suggests that a significant proportion of prevalent disease remains undiagnosed. The diagnosis gap is the difference between the proportion diagnosed with the condition and the expected prevalence which includes those who are undiagnosed. The diagnosis gap gives an indication of how many people in the local population are undiagnosed but may have that condition and so indicates the potential to find and treat people at an earlier stage of the disease. At time of writing the current estimated diagnosis gaps in Surrey are only available for hypertension and diabetes . QOF data for 2015/16 show that undiagnosed hypertension (23)in Surrey averages nearly 50% while undiagnosed diabetes averages 30%. The proportion of undiagnosed patients with diabetes (24)is estimated to be substantially higher in Surrey CCGs than the England average, an area of concern, as undiagnosed cases may suffer complications as a result of a delay in timely diagnosis (see data visualisation). Estimates for other conditions such as coronary heart disease and stroke for instance will be available shortly. Bearing in mind the burden which LTCs places on individuals and the health economy as a whole, a strong emphasis on active disease detection should form part of any programme to improve care and quality of life for local residents. Avoiding emergency hospital admissions is a major concern for the National Health Service (NHS), not only because of the high and rising unit costs of emergency admission compared with other forms of care, but also because of the disruption it causes to elective health care – most notably inpatient waiting lists – and to the individuals admitted. Also hospital admissions may indicate a failure of prevention because patients have not received the care they could have had earlier on to prevent more acute presentation. The data for emergency (and elective hospital admissions) 2010/11 – 2014/15 is broken down by local authorities, CCGs and Wards. Data can be compared with England rather than with each other as the local population differences have not been taken into account (see data visualisation). Although variation could be reflective of differences in the population it may also be indicative of differing clinical practice which could improve local care. People with LTCs are frequent users of emergency services. It has been estimated that up to two-third of unplanned admissions are in people with LTCs. We should develop joint actions locally aimed at reducing and preventing those admissions will improve quality of life but will also reduce pressures on local hospitals. The data in this section (see data visualisation) is available by local authorities. The indicator measures the rate of emergency hospitalisation per 100,000 population for patients with long term-term ambulatory care sensitive conditions. However the data cannot at this stage be segmented by conditions. 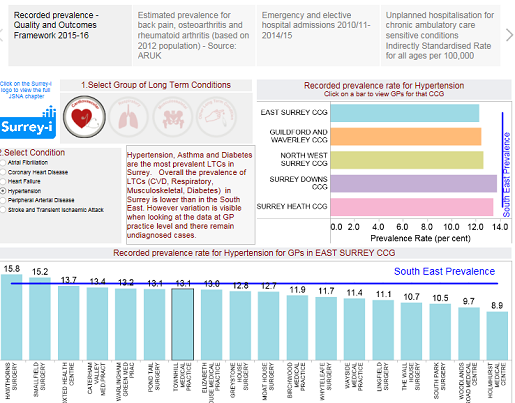 The Directly Standardised Rate (DSR) for unplanned hospitalisation for chronic ambulatory care sensitive conditions is variable across Surrey’s 11 Boroughs and Districts. Surrey’s rate as a whole is 517.3 (DSR for all ages per 100,000 registered patients) which is substantially better than England’s 807.4. Tandridge and Reigate and Banstead have the lowest rate of unplanned hospitalisation out of Surrey’s 11 boroughs and districts at respectively 137.2 and 302.1. Interestingly both local authorities are the only two in Surrey whose rate drops significantly in 2007/08 and plateau thereafter. For instance the rate in Tandridge was 529.6 in 2006/7 and 188 in 2014/15. In Reigate and Banstead the rate dropped from 634.7 in 2006/7 to 302.2 in 2014/15. We have not yet been able to ascertain the reasons for those changes. Surrey Heath and Runnymede have the highest rate of unplanned hospitalisation at respectively 689.5 and 671.5. It is worth noting that if we look at unplanned admissions by quarters, Q3 (Oct-Dec) of each year sees on average the highest rate of unplanned hospitalisation which may suggest a seasonal impact in relation to this indicator. It is also worth noting that the number of hospital episode statistics (HES) in Surrey for unplanned hospitalisation by condition is two thirds higher (1516) in areas in the highest deprivation decile than by deprivation decile in areas with the lowest (475) (see NHS Digital dataset). It shows that the indicator value in the most deprived areas is much higher than in the least deprived. This reinforces the link between deprivation and diseases. The mortality rate (all ages – combining both gender) from all circulatory disease in Surrey is lower (220.5) than the South East (238.3) and England (256.4). The rate is much higher in men (267.8) than women (181.9) (see data visualisation). The mortality rate from all circulatory disease for under 75 mirrors the same patterns. At time of writing the mortality rate for all respiratory disease in Surrey is not available. The mortality rate (all ages – combining both gender) from CHD in Surrey is lower (89) than the South East (98.3) and England (114.1). The rate is much higher in men (124.8) than women (60.6). The mortality rate for under 75 mirrors the same patterns. The mortality rate (all ages – combining both gender) from strokes in Surrey is slightly lower (58.21) than the South East (60.04) and England (64.28). The rate is also higher in men (64.29) than women (53.07). As for the under 75, the rate mirrors the same patterns although the mortality rate in men is slightly higher (14.35) than the South East (13.75). Years of life lost (YLL) is a measure of premature deaths, i.e. those under the age 75. Included in this measure are a number of LTCs including diabetes, cardiovascular disease, respiratory diseases (including COPD and pneumonia). Most of these conditions are considered amenable to healthcare apart from COPD and while CHD, hypertensive disease and stroke are considered amenable to healthcare, not all cardiovascular disease is. The purpose of looking at YLL is to compare the relative importance of different causes of premature death within a particular population and also it can be used to compare the premature mortality experience of different populations for a particular cause of death. The DSR for pneumonia in Surrey (6.5) is also lower than the South East (7.1) and England (8.5). The rate is higher in men (7.8) than women (5.3). Enhancing the quality of life for people with long term conditions remains a key priority for the NHS, and primary care has been identified as crucial to the support the NHS can offer to these people. The GP Patient Survey (GPPS) helps us understand a little bit more about the experiences of these patients in relation to general practice (29). Nationally patients with long term conditions are more positive about their GP practice than those without, in relation to both quality and access. Analysis of GPPS data by Ipsos MORI shows that over three quarters (76%) of patients with a long term condition agree that they have a good experience of making an appointment at their practice (compared with 71% without), and they are more positive about the convenience of their last appointment; half (50%) say their last appointment was very convenient compared with 43% of those without a long term condition. They are also more positive about the different aspects of their last GP appointment, such as the GP giving them enough time, listening to them, and treating them with care and concern. The same is true about their last nurse appointment (30). Patient experience is fundamental to a better management of LTCs and to a better approach to planning treatment and care support by a wide range of professional services. Patients should be at the centre of this system and should be empowered to drive system change. The management of care for people with LTCs should be proactive, holistic, preventive and patient-centred says a recent report by the King’s Fund (31). Of particular significance is the link between care planning for individuals and commissioning for local populations; it aims to make best use of local authority services (including social care and public health) and community resources, alongside more traditional health services. Enhancing quality of life goes hand in hand with the ability to deliver a better service to people with LTCs. RightCare has identified opportunities across Surrey CCGs to improve the quality of care which patients receive while managing expenditure in a better way. The refreshed ‘Where to Look’ Commissioning for Value packs 2016) examined performance data for each CCG area across the 10 highest spending programmes of care to highlight the top priorities for improvement and transformation. Opportunities have been identified for potential non-elective savings in relation to musculoskeletal conditions across 4 Surrey CCGs; East Surrey, Guildford and Waverley, North West and Surrey Heath. As the prevalence of Type 2 diabetes is predicted to rise in the coming years, in line with the increasing trend in obesity, those who are obese are more likely to subsequently develop Type 2 diabetes. Surrey, which is part of the South East Strategic Clinical Network (SCN), is in a strong position to counteract the predicted rise in Type 2 diabetes because Surrey CCGs and the County Council are partners in Wave 1 of the National Diabetes Prevention Programme (NDPP). The NDPP represents one part of the whole preventative package surrounding increasing physical activity and decreasing obesity locally, with the NDPP aligning with the local physical activity, alcohol and childhood obesity strategies. People with long-term conditions typically have contact with healthcare professionals for a relatively tiny amount of time – around three hours per year (32) . This means that patients and their carers are, by default, taking the lead in managing their care for most of the time. If people are not given more control, and supported to become experts at self-managing their conditions, they risk feeling abandoned and – if they are unable to self-manage – may be at an increased risk of health crises, which can require emergency health services (33) . The percentage point gap in the employment rate between those with an LTC and the overall employment rate is 5.9% which is better than England. There is a definite consensus across health and social care that reducing variations in care and outcomes should be a top priority in relation to long-term conditions clinical outcomes. In their Sustainable Transformation Plans (STPs) all Surrey CGGs have admitted to variable levels of care and quality issues regarding the treatment and management of some long-term conditions. Adding to this picture, financial pressures are putting a considerable amount of stress on existing services and commissioners at a time when reducing avoidable illnesses and conditions is proving a challenge. Adults should have their blood pressure measured at least once every five years. Once tested, NICE recommends that adults are re-measured within five years and, more frequently for people with high-normal blood pressure or in high risk groups. Personal behaviour change on diet, physical activity, alcohol and smoking, particularly prompted through individuals’ regular contacts with healthcare and other institutions. It is advised to review the processes for the 9 care quality checks for diabetes across all GP practices within CCGs to ensure their promotion. Another challenge facing commissioners and providers is directly related to the UK’s ageing population. Musculoskeletal conditions for instance now represent the largest proportion of years lived with disability in the country. With people living longer, rising obesity and reduced levels of physical activity will de facto impact on the increasing prevalence of these conditions and the associated demand on local services (39) . MSK services already account for the largest pathway spend across a number of Surrey CCGs. It is recommended that local CCGs work towards a single MSK pathway across the county with the view to increase efficiency of MSK practitioners and improve health care outcomes for patients. An increased focus on identifying and addressing the causes of diseases over the life-course is therefore essential and reinforces the need for a more systematic and proactive management of chronic diseases. This will improve health outcomes, reduce inappropriate use of hospitals, and have a significant impact on health inequalities (42) (see JSNA Chapter: Improving Health Behaviours). It is estimated that 80% of cases of heart disease, stroke and type 2 diabetes, and 40% of cases of cancer could be avoided if common lifestyle risk factors were eliminated (43). The National Audit Office (2010) suggests that improving cholesterol levels and hypertension control have not been adopted at a sufficient scale. If they were, they would have a significant impact on inequalities (44). It is recommended that commissioners explore all opportunities to improve workforce development and skills in relation to modifiable health behaviours through MECC. 7. Majid Ezzati, Stephen Vander Hoorn, Alan D. Lopez, Goodarz Danaei, Anthony Rodgers, Colin D. Mathers, and Christopher J. L. Murray, Comparative Quantification of Mortality and Burden of Disease Attributable to Selected Risk Factors – Global burden of disease and risk factors, The International Bank for Reconstruction and Development / The World Bank; New York: Oxford University Press; 2006. 9. Roland M, Abel G (2012). ‘Reducing emergency admissions: are we on the right track?’. British Medical Journal, vol 345, e6017. 15. National Cardiovascular Intelligence Network, Hypertension profiles for clinical commissioning groups, last updated January 2016. 17. Royal National Institute of Blindness. 21. Ringham L (2013). Access all areas? A report into the experiences of people with hearing loss when accessing healthcare. Action on hearing loss. 23. McCann RM, Jackson J, Stevenson M, Dempster M, McElnay JC, Cupples ME (2012) Help needed in medication self-management for people with visual impairment: case–control study. Br J Gen Pract 2012; DOI: 10.3399/bjgp12X653570. 30. The King’s Fund, Delivering better Service for People with Long Term Conditions, Building the house of care, October 2013. 31. Health Foundation (2013) ‘Submission of Evidence to the Health Select Committee’s long-term conditions inquiry’, London. 32. Institute for Public Policy Research (IPPR), Catherine McDonald, Patients in control : Why people with long-term conditions must be empowered, 2014. 33. Laura Matthews, Action on Hearing Loss, Quality Time : Do quality of life issues inform the advice that audiologists give to people with hearing loss ? 40. National Audit Office (2010). Tackling Inequalities in Life Expectancy in Areas with the Worst Health and Deprivation: Executive summary. Available at: www.nao.org.uk/report/tackling-inequalities-in-life-expectancy-in-areas-with-the-worst-health-and-deprivation.